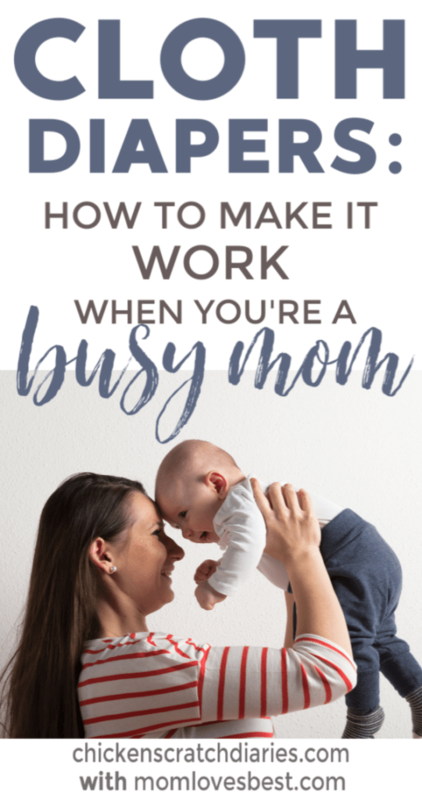 Whether you have a full-time job outside of the home, you work at home, or you have more than one kid, it’s easy to feel overwhelmed as a mom. What should you do when you want to attempt cloth diapering because you’ll save money and it’s better for the environment, but you aren’t sure you’ll have time for it? 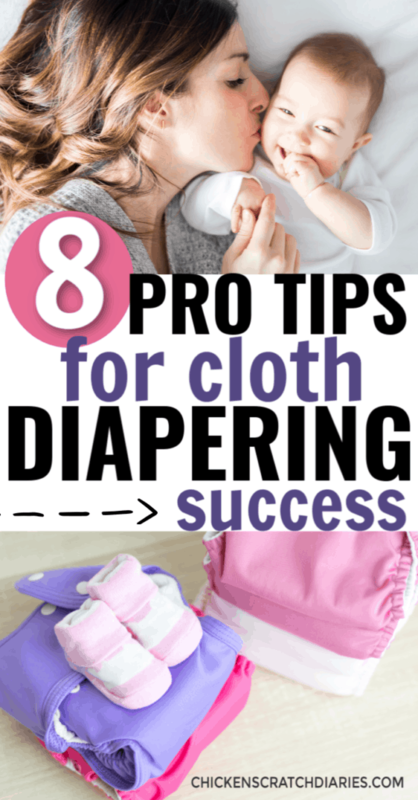 Here are almost all the tips you need to incorporate cloth diapers into your busy lifestyle. This article is a guest post by Jenny from Mom Loves Best. Cloth diapers can be fairly complicated if you choose to go with ones you need to add inserts to, or they can be as simple as disposables. If you want a one-step diaper that is pretty close to how a disposable works, you can buy all-in-one cloth diapers. They have everything you’ll need to prevent leaks and hold that mess in. They’ll have an absorbent interior, elastic waist and legs, waterproof exterior, and a handy closure method. But they also won’t require any extra effort on your part other than washing them. You won’t have to stuff or fold anything, and they’ll be easy for any caregivers to use as well. Before you buy all your diapers in one brand, you should consider buying one each of several different kinds. Cloth diapers do require a fairly significant upfront investment and you’d hate to spend all that money only to find you don’t like the kind of diaper you bought. Since you’re new to the world of cloth diapering, it’s smarter to buy a variety so you can figure out which type you like without putting a huge dent in your budget. There’s no right or wrong answer here. But it’s something to consider when you’re a busy mom. If you buy too few diapers, you’ll be doing laundry more frequently, and depending upon your schedule, that might not work for you. On the flip side, you don’t want to buy so many diapers that you aren’t doing laundry for three or four days at a stretch. That might sound ok on the surface, but those unwashed diapers will create a stench. Some women prefer to just spend enough to have a day’s worth of diapers on hand, but I like to have three days’ worth, which I consider to be about 24. But it depends upon how frequently you change your baby. I don’t like to be a slave to my washing machine, and doing laundry every two days or so is something I can live with. Plus, I like having a few extra diapers on hand because when your child gets a virus that gives them diarrhea, you don’t want to run out of diapers because you can’t wash them fast enough to keep up. As a busy mom, the last thing you want to do is procrastinate. You’ll start falling behind and feeling the pressure. That applies to cloth diapering as well, depending upon which style of diaper you choose. If you choose to go with pocket diapers, which are like all-in-ones except you stuff a reusable insert into the interior pocket, here’s a tip for you. As soon as you take those diapers and inserts out of the dryer, stuff them right away. That will prevent you from having to check repeatedly if your child’s diapers are stuffed and ready to go because you’ll automatically know they are. You should also know where you’re at in your diaper stash. You don’t want to think you still have a few clean diapers on hand and then freak out when you realize you’re on your last one instead. You’re looking at a good hour and a half to wash and dry these diapers, instead of simply driving to the store and picking up a pack of disposables when you discover you’re out of diapers. So the only way to stay on top of things is by staying organized. If cloth diapering seems like a big commitment, it’s okay to do it halfway. It’s not an all or nothing prospect. Some moms find a combination of cloth diapers and disposable diapers works best for them. Others don’t like the work of managing cloth diapers while traveling, so they use disposables for vacations and cloth diapers at all other times. Only you can figure out what works for you. And if you’re using cloth diapers to help the planet, you’ll still be doing your part if you only use disposables once in a while. One of the downsides to cloth diapering can be getting rid of the solids your baby leaves behind in the diaper. Nobody likes to handle poop, but it’s not a big deal if you have the correct equipment. Attaching a sprayer to your toilet can be just the reinforcement you need. All you have to do is dump the clumps and give the diaper a quick blast with the sprayer, aiming any mess right into your toilet. Then you just flush it down and put the diaper in your dirty pile until you’re ready to wash it. You won’t have to scrub or soak those diapers, which will save you a boatload of time and cut down on the grossness factor. And installing the sprayer is quick and easy. Unless your idea of a good time is walking around the house and opening all the windows to get some fresh air in and that baby urine smell out, you’re going to want to find a way to cut down on the odor. 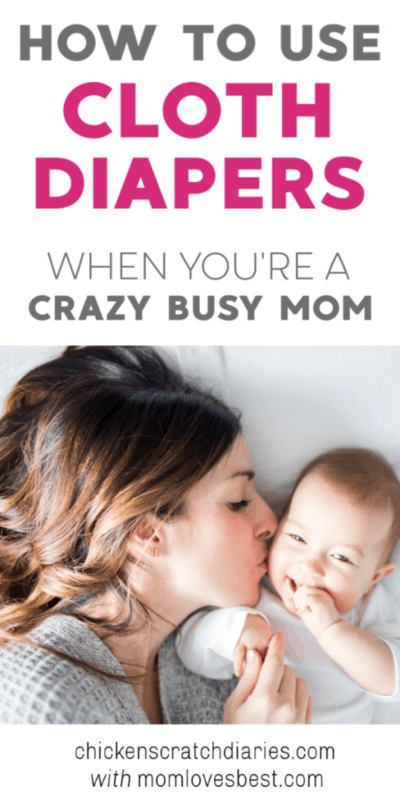 Wash the diapers daily: If you’re super busy, this might be an issue. But if you make a system or habit out of it, it can become second nature. As soon as you come home in the evening from work, you can run a load straight to the wash. Then right before you make dinner, you can put them in the dryer. By the time baby is in bed and you’re settling in to watch television for a few minutes before bed, you can put any inserts into each diaper to prepare them. Buy a wet bag: A wet bag is made out of fabric, and it manages to keep both the smell and any mess inside. You can wash the bag along with the diapers so all smells are truly eliminated. Another perk of wet bags is that you can take them on vacations with you to store dirty diapers. Buy a diaper pail that contains the smell: Diaper pails can work for cloth diapers as well, but keep in mind, the inside of those pails will still smell. That’s why I prefer a wet bag for cloth diapers, it gets rid of the smell with every wash, unlike with a diaper pail which seems to always stink unless you bleach it out. As with anything else, there’s a learning curve when it comes to cloth diapers. You’ll want to familiarize yourself with the different types that are available and figure out which type will work best for you. Just remember, no matter how busy you are, you can still find a way to use cloth diapers if that’s important to you. Just stay on top of the little tasks like rinsing the diapers right after use and keeping the smell contained and you’ll do just fine. Jenny Silverstone is a passionate cloth diapering mama of two, and a professional writer by trade for the parenting blog Mom Loves Best. If you would like to reach out and chat to Jenny you can find her spending way more time than she probably should on Facebookand Pinterest.